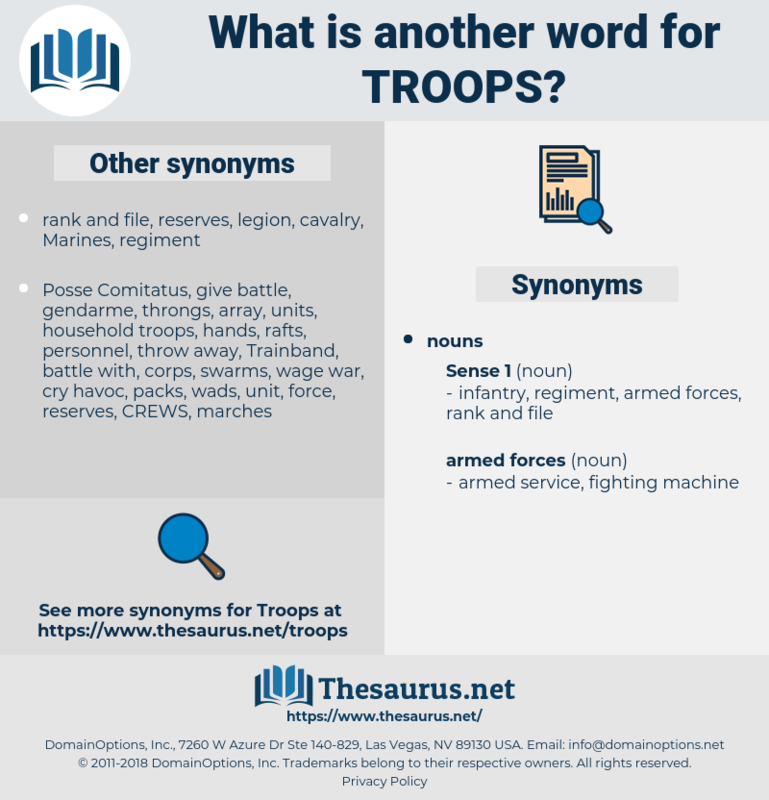 What is another word for troops? MENS, Americans, rangers, Companies, Canadians, guides, officers. peacekeepers, officers, Serbs, combatants, Veterans, force, forces, GIS. commanders, patrols, factors, components, Helicopters, squadrons, conscripts, considerations, regiments, positions, militias, Persons, detachments, posts, Populations, prisoners, confrontations, conflicts, Missions, consolidations, bombings, restrictions, workforces, professionals, contributions, establishments, Policemen, divisions, Capabilities, fighters, consignments, formations, counterparts, men-at-arms, powers, Periodicals, requirements, CREWS, residents, Casualties, Ships, sources, gatherings, tasks, aspects, enhancements, cohorts, solders, Sailors, restraints, Territories, recruits, Mercenaries, Parties, Exercises, supplies, processes, points, witnesses, Carriers, Democracies, allocations, Movements, arrangements, officials, battles, remnants, individuals, vanguards, groupings, groups, sections, materials, weapons, locations, workers, features, cadres, herds, factions, allotments, ensembles, employees, Students, fugitives, Americans, souls, squads, rangers, departments, crowds, mandates, Quantities, Ones, regulars, Countries, ranks, Companies, Strikes, warriors, encounters, Gentlemen, militants, states, Rallies, Boots, sites, Males, columns, owners, hammers, shapes, Gunners, intakes, fellows, Vehicles, Husbands, Activities, invaders, Drills, masses, Hires, clashes, Plants, pixels, pieces, fellas, Forms, bullets, Entities, chechens, items, centres, agents, Energies, Bases, flocks, Lives, women, data, sides, modules, needs, boys, limits, dudes, levels, gangs, sexes, Drives, lands, Bodies, guys, Branches, ducks, beings, Agencies, figures, blocks, guides, peacekeepers, officers, combatants, Veterans, LINEs, contingentes, elements. 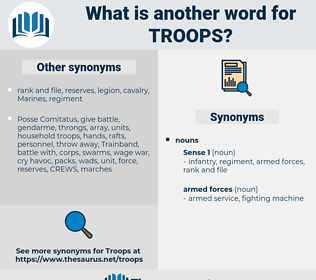 troop, servicemen, troupes, military, corps. garrisons, troopers, Reinforcements, battalions, paratroopers, attacks, contributors, guerrillas, tanks, servicemen, troupes, militaries, militarys, military. In a call for troops he was passed by. If it flew right on before the troops without returning it was a good sign.